This unusual converted horse wagon offers luxurious glamping accommodation, plus all the facilities at Brooks Country House Hotel, including a sauna and an outdoor heated swimming pool (June-Sept only). 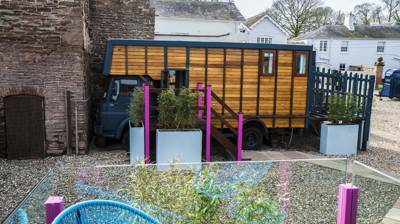 This horsebox can accommodation 2 adults and 2 children up to the age of 12 years (a double bed and 2 bunks). This unusual, quirky converted horse wagon offers luxurious glamping accommodation, with the added benefit of all the facilities on offer at Brooks Country House Hotel, a stunning 22-bedroom Georgian manor, including a sauna and an outdoor heated swimming pool (June-Sept only). This horsebox can accommodation 2 adults and 2 children up to the age of 12 years in the large double bed and 2 bunk beds.